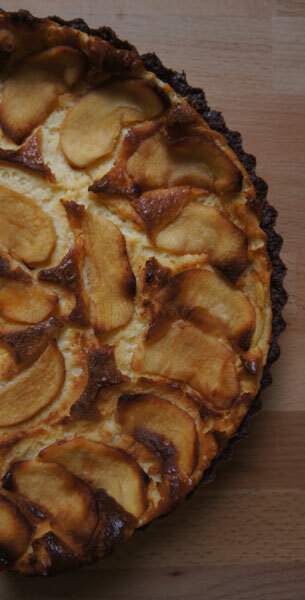 Another pie, well, this one is more a cheesecake than a pie, a mascarpone cheesecake. I am sure you don’t mind me posting another cake, do you? I saw this recipe on undici mesi, one of the first blogs I started following. The picture was inspiring so I decided to try it. Little did I know that the ingredients where all messed up XD So… well… I improvised! It turned out great! 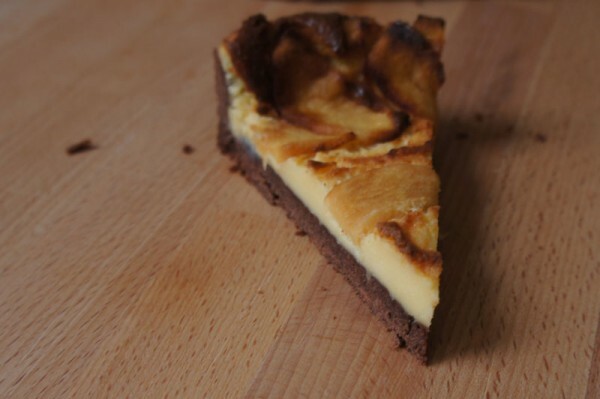 Similar to a cheesecake, but with a nicer flavor due to the use of mascarpone cheese instead of cream cheese. The cream is flavored with lemon and vanilla, I would have eaten the filling with a spoon, right there! And that mascarpone filling on top of the chocolate pasta frolla (short pastry dough), well everything is great on top of chocolate pasta frolla ;) And finally the apples on top were the icing on the cake, uhm, not literally! So here goes my recipe, based on someone else’s idea. The chocolate pasta frolla (short pastry dough) is prepared as usual, the only difference is that first you mix the cocoa with the flour and then proceed. How do you proceed? For full directions see my post on pasta frolla – short pastry dough, note that for chocolate pasta frolla you need a little more butter. For the quick version of the instructions continue reading. If you have been following BeyondPasta for a long time you probably know these instructions already, crostatas with a base of pasta frolla are my favorite cakes, but I can’t assume that everybody is an aficionado so here are the directions one more time. And since we are on the subject, whether this the first time you stumble on BeyondPasta or you have been following my American and Berliner adventures since the beginning, you are welcome to say hi or ask a question in the comments section below. Every comment on a blog grants a smile on a blogger. Plus did you see that BeyondPasta is now offering cooking classes in Berlin? 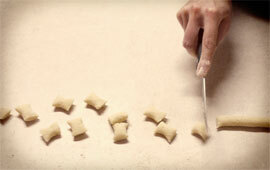 I am thinking about a class on stuffed pasta, who’s up for it? 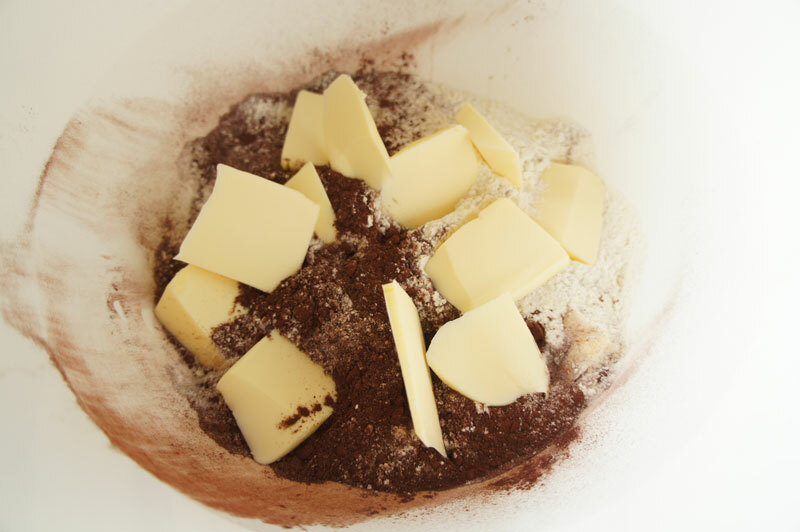 Steps for chocolate pasta frolla: mix the flour and the cocoa. Add the butter in small chunks. Mix with your fingertips to break the butter and create a sandy consistency. Add the sugar, salt, egg, egg yolk and brandy. Mix quickly, wrap in plastic and store in the refrigerator for 30 minutes. Meanwhile prepare the filling. Beat the egg yolks with the sugar until they are light and fluffy, they will turn white (Picture 1). Add the vanillina (or vanilla flavor) and lemon rind and mix. Add the mascarpone, a little at a time and beat to eliminate lumps. Add the starch and rum and stir one more time to incorporate (Picture 2). Now set aside and do your best not to grab a spoon and eat it all! You will need it all for your mascarpone cheesecake, you can’t spare any. Preheat the oven to 180°C (365°F). Peel the apples (depending on your taste you may want to use 2) and slice it. 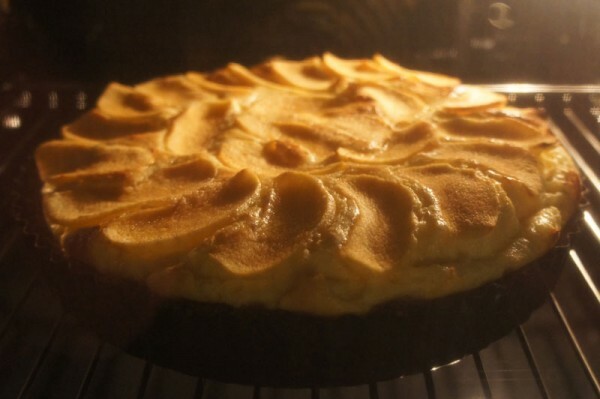 I cut one apple in really thin slices and made just one layer on top of the cake (I used about three quarters of the apple), I didn’t want the husband to complain about the apples… You know how husbands are, right? 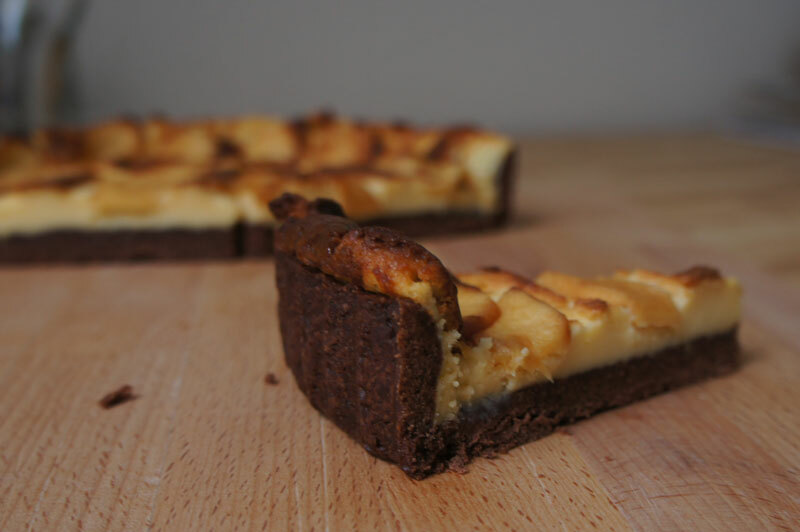 Anyway, I would highly suggest you to make a nice layer of apples on top of the cake, their flavor combines very well with the cheese filling and the chocolaty pie crust. I used too few of them. Butter and flour a 28 cm (11″) pie pan. Get the chocolate pasta frolla from the fridge. Roll the dough in a circle large enough to cover the bottom and the sides of the pan. 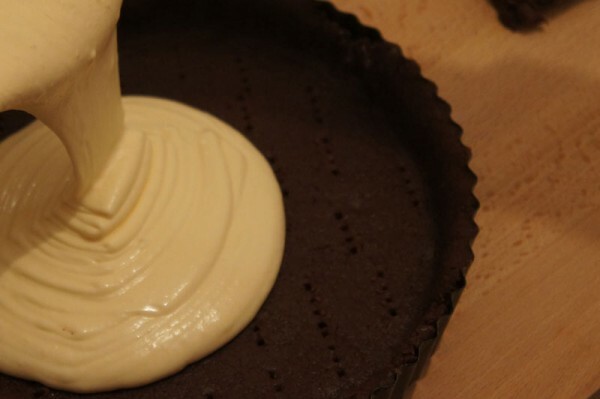 Line the pie pan with the chocolate pasta frolla, and prick the bottom with a fork. Pour the filling on the pie crust. Cover with apple slices. Dust with some brown sugar. Transfer to the oven and bake for 50 minutes. 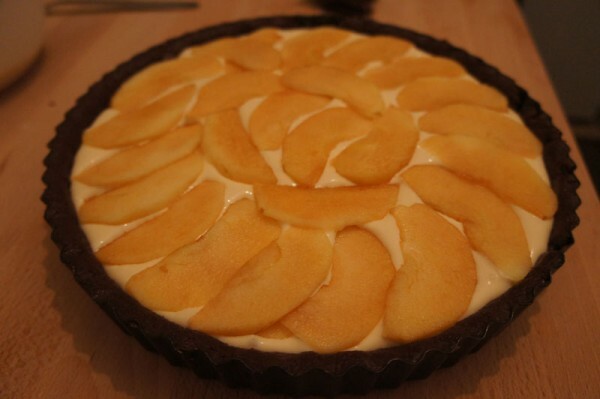 I baked my mascarpone cheesecake with the air function of the oven with the result that my apples turned brown :/ No air next time! Let cool before cutting so the filling will set. Ah I know, it’s a pain! But for cakes, cookies and such, the right flour is almost always Weizen Mehl Type 405. Potato starch instead is called Feine Speisestärke.